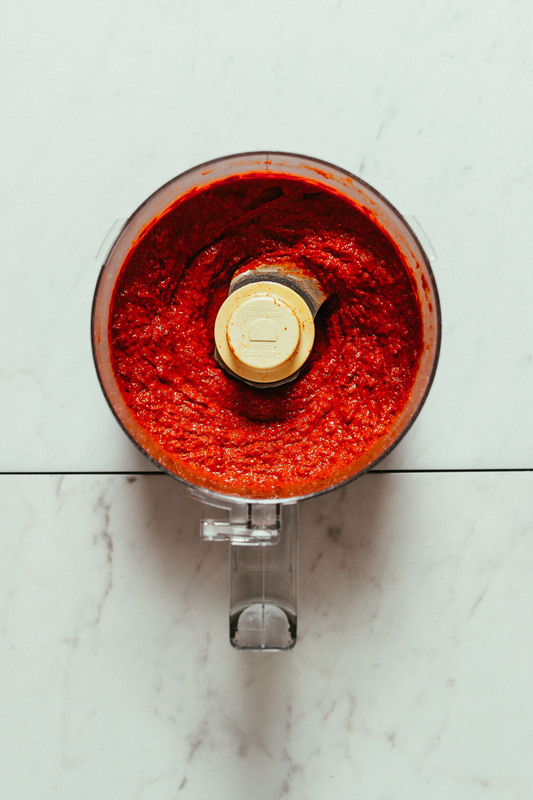 Have you ever seen a recipe that called for “harissa paste,” but weren’t sure what it was? I’ve been there. In my earlier days of cooking I used to either skip it altogether, or substitute with whatever hot sauce I had on hand. Fast forward to now, and I use harissa paste — a North African spicy red sauce — all the time. It consists of simple ingredients like red chilies, garlic, vinegar, and spices, and is perfect for adding smokiness and heat to dishes like hummus, lentil chili, pasta sauce, and more. 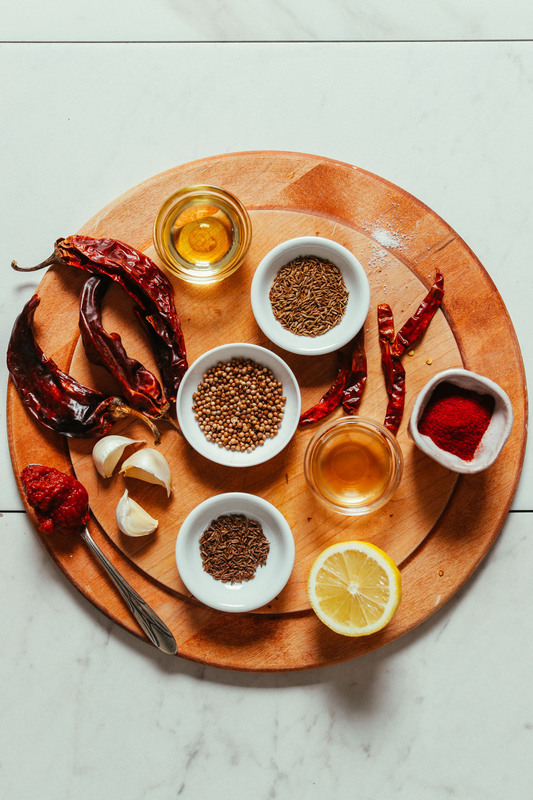 I typically buy harissa at the store, but recently have wanted to make my own so I could control the spice level — some can be quite hot, which throttles how much you can add to your meal. 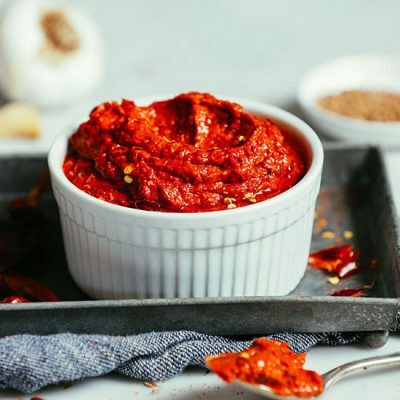 Let me show you how easy it is to make fresh harissa paste (and adjust the heat to your liking) at home in just 30 minutes! The ingredients for harissa paste are pretty simple. 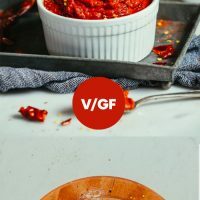 The two you may not have on hand are dried chilies — which most grocery stores carry, and are easy to find online (links below) — and caraway seeds, which add a mild licorice flavor. Caraway seeds are a common ingredient in harissa paste, but if you don’t have them, fret not — simply leave them out or compensate with more of the other spices. First, rehydrate your chilies in hot water, then remove the stems and seeds. 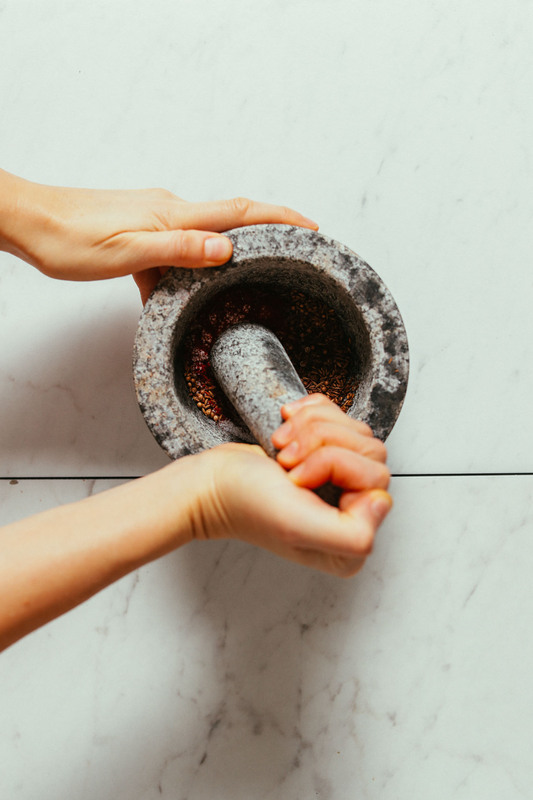 While that’s happening, toast your whole cumin and coriander seeds and grind in a mortar and pestle. 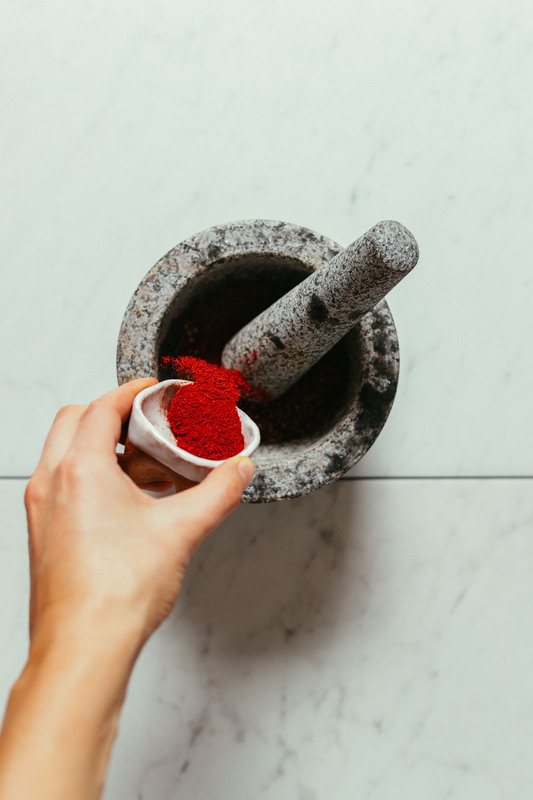 If you don’t have a mortar and pestle, simply add to a food processor to blend later. Next you’ll add smoked paprika, salt, and garlic, and mix again, before adding lemon juice and vinegar and mixing into a paste. Once all of your ingredients are added to the food processor, blend into a smooth paste. Add olive oil near the end to create a creamy, smooth sauce. If avoiding oil, either omit or sub water for a similar effect. Harissa can be added to dishes like my Moroccan-Spiced Eggplant & Tomato Stew, Saucy Moroccan-Spiced Lentils, and Smoky Harissa Eggplant Dip. But it’s great for adding depth of flavor, nuance, and smoky spice to just about any dish, including hummus, salad dressings, pasta sauce, soups, and more! 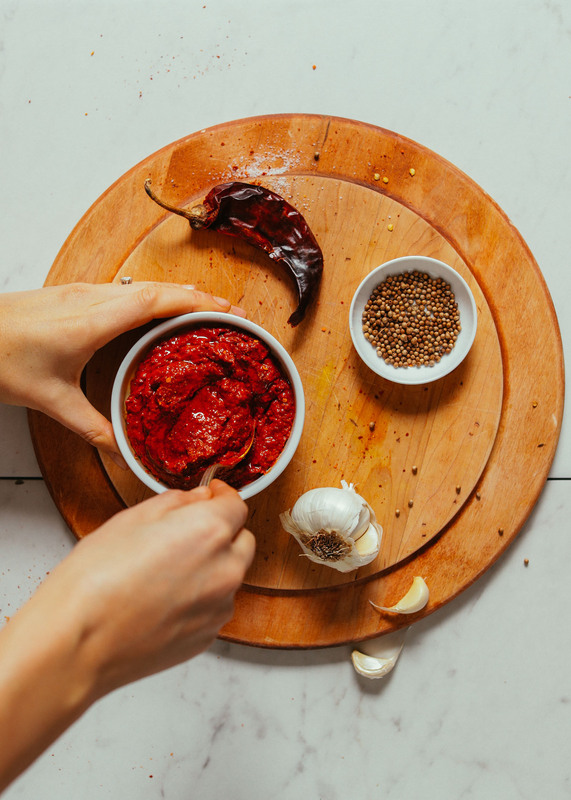 If you’re into DIY sauces and spices, you’ll also love our Hummus from Scratch, Easy Green Curry Paste, Easy Red Curry Paste, Easy Oil-Free Vegan Ranch Dressing, and DIY Curry Powder! 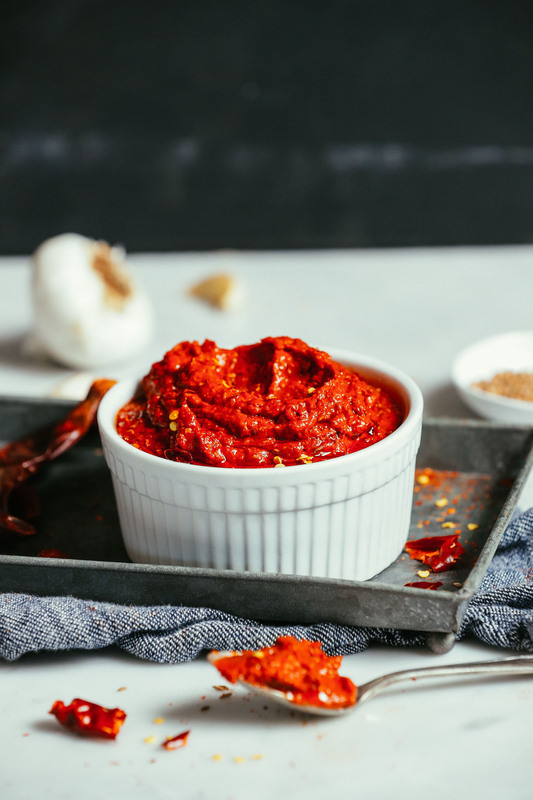 How to make harissa paste in less than 30 minutes! Enjoy using this North African spicy red sauce to add heat to dressings, sauces, soups, and more! Add dried chilies to a mixing bowl or measuring cup and cover with hot water. (We used a mix of mild New Mexico chiles and hot peppers (chiles de arbol). Adjust the ratio to preferred spice level.) Once submerged, cover and steam for 15-20 minutes to rehydrate. Set aside. In the meantime, add cumin and coriander seeds to a small skillet and toast over medium heat for a few minutes, or until fragrant and they start to pop. Then transfer to a mortar and pestle (if you don't own one, just add to a food processor to mix later), and crush into a fine powder. Next add caraway seeds, minced garlic, smoked paprika, and salt, and mix. Then add lemon juice and vinegar and mix again until you've achieved a paste. Transfer paste to food processor and add the tomato paste. Set aside. 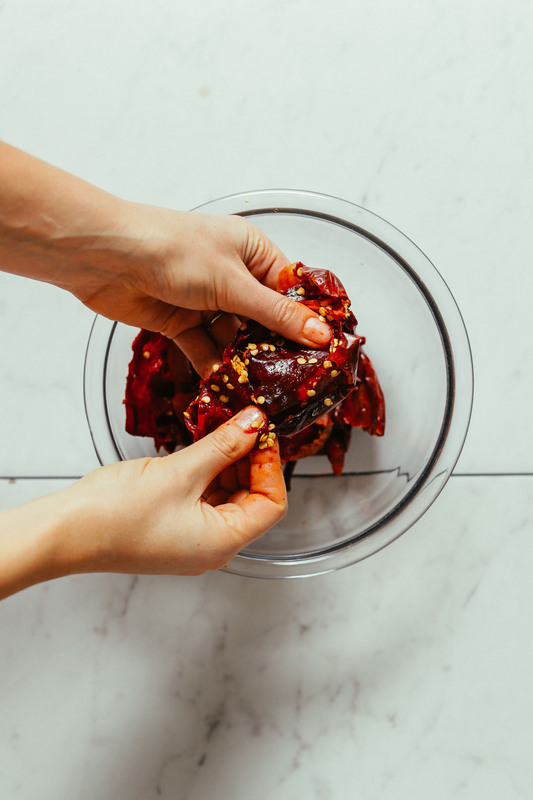 Once chiles are rehydrated, drain and remove the stems and seeds (I recommend wearing gloves to protect your hands), then add to food processor. At this point, all ingredients (besides olive oil) should be in the food processor. Taste and adjust flavor as needed, adding more lemon or vinegar for acidity, paprika for smokiness, tomato paste for depth of flavor, or salt to taste. If it's not spicy enough at this point, you can either add more chiles de arbol (rehydrated and seeds removed) or cayenne pepper to taste. Scoop paste into a jar to store in the refrigerator for up to 1 month. If storing in the freezer, we recommend scooping into an ice cube tray, freezing, and storing in a freezer-safe container up to 2 months. Add cubes directly to warm foods (like stews or cooked sauces). If adding to cold foods (like dressings or dips), let thaw before adding. I LOVE this recipe. I have now made this several times and it never lasts in our house. We use it for pasta, zoodles, sandwiches and dip. Love it. Wouldn’t change a thing. Thank you so mich for sharing! This looks wonderful. I am just wondering how long it would keep in the fridge or freezer? Hi Shannon! Stored in the refrigerator, it will last for up to 1 month. If storing in the freezer, we recommend scooping into an ice cube tray, freezing, and storing in a freezer-safe container up to 2 months. Hope this helps! I would love a quick write up on how you use this in your simple pasta recipe–the one you posted on your Instagram story! Thank you! My comment, unfortunately, does not deal with the harissa paste. Instead, I wanted to say kudos to you! Jane Esselstyn and her mother, Ann, have a youtube channel. Today, they featured a recipe for Roasted Cauliflower and Lentil Salad that was inspired by you, the Minimalist Baker. This is from Jane Esselstyn’s youtube channel. Ann’s husband, and Jane’s father, is Caldwell Esselstyn, MD, who wrote the book, “How to Prevent and Reverse Heart Disease”. Dr. Esselstyn’s book explained the benefits of a whole food plant-based diet before this way of eating even got its present name. As far as I am concerned, this is a great honor for you. Congratulations, and keep those recipes coming! This recipe looks really interesting but my family don’t really like spicy, hot food, is it possible to make this with red bell peppers? We are not sure this would work with fresh bell peppers as the recipe uses the dried form of chilies. 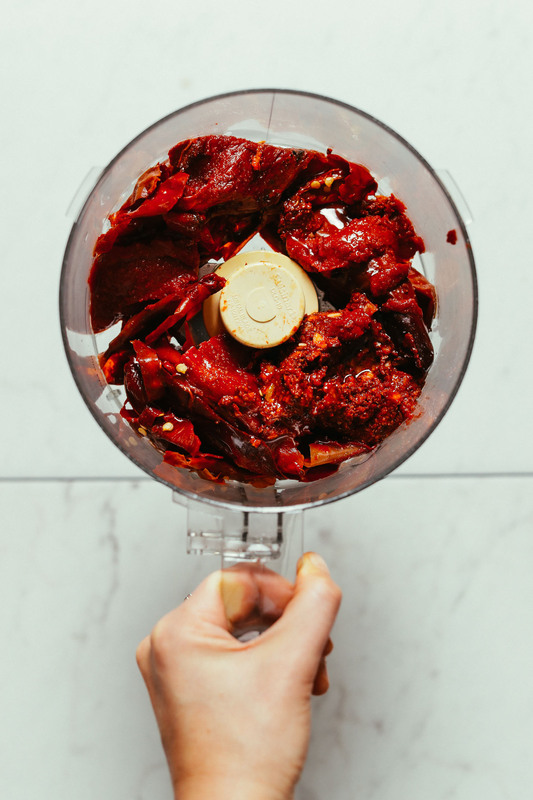 If you could find dried bell peppers, there’s a better chance it could work, but we haven’t tried it. If you decide to give it a try, we would love to hear how it goes!